"There is a battle of significant consequence taking place in the lives of boys in America today. In simple terms, it is the battle between doing what is right or wrong. A recent study conducted by Louis Harris & Associates indicates that the proportion of boys choosing to do what is wrong is alarmingly high. Even basic values such as not cheating on schoolwork and not stealing seem to be unstable. Clearly, the results of this study indicate that our nation's youth are struggling with ethical and moral decisions, and that these difficulties can only increase with age. Therefore, the need for reinforcing and rewarding strong moral standards and providing positive role models at a young age is more important than ever before. 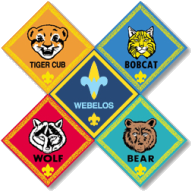 Cub Scouting creates a climate of cooperative and collaborative relationships between adults and children--a laboratory for adults and children to get to know one another. It provides opportunites for children to acquire the capacity for accomplishment. The program affirms to the child that the world really is an interesting place. Cub Scouting is fun! But it is fun with a purpose. Woven though all the fun is an inspired program that really works. Tried and proven methods are used that transfer traditional values, build character, and develop leadership skills -- all in the context of fun and family togetherness."